The Right Brain: You Think These Things Grow on Trees? You Think These Things Grow on Trees? From the time I was about age 11, I spent a good part of summer vacations at the construction site building houses with my dad who had a small construction company. One day we were framing a house and had just nailed down the plywood over the floor framing. Dad told me to go down and throw up some studs so we could start framing the walls. After waiting a few minutes and no studs, he walked over to the edge to see what was the hold-up. As soon as he appeared over the edge of the house, I bent over and began retching and heaving loudly as if I was trying to vomit. Finally I looked up and said, "Dad, I've tried and tried but I just can't 'throw up' any studs". We had a good laugh, and then it was back to work. 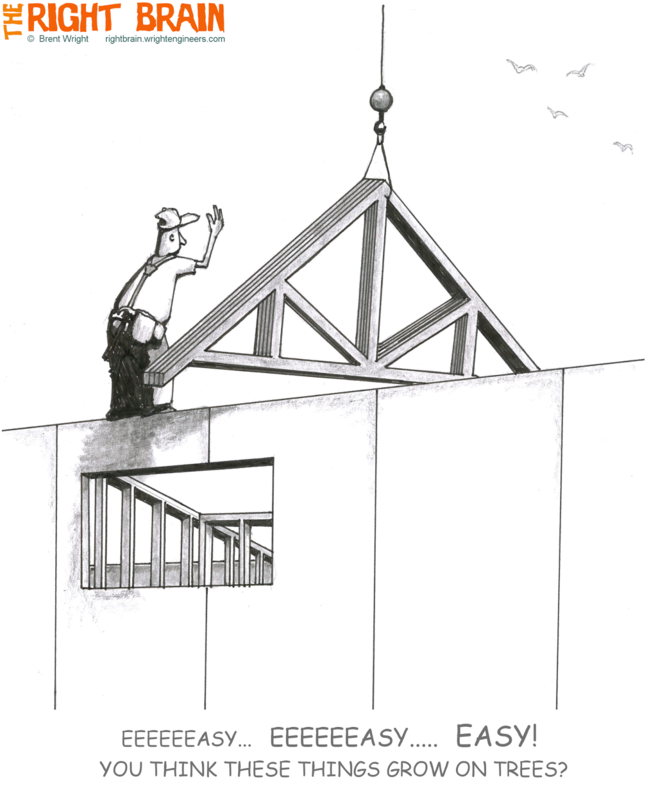 Unlike this guy, we never had a crane to lift our trusses. Instead, we hefted them up by hand one at a time. It was always a relief when the roof trusses were all safely standing in place.